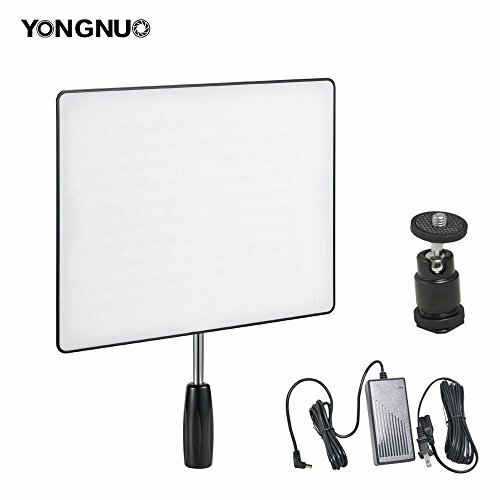 YONGNUO YN600 Air has a slim and light design,and it adopts super larger luminous LED Light panel.YN600 Air perfectly substitutes prefessional soft light panel for the traditional heavy and bulky soft light box which bring many inconveniences.the light of YN600 Air is softer and more natural; the volume of the YN600 Air is smaller and lighter. YN600 Air supports using lithium batteries or other power supply to meet the requirements of different scenarios. •YN600 Air adopts SMD light source. With super large illuminating angle and light panel, it's more suitable for light filling. •High Brightness and 5500K Daylight balanced, built in SMDs of super large light-emitting area. In the equivalent energy consumption, the luminous intensity is higher. •CRI95+ nature color, adopts SMD LEDs of ultrahigh CRI (color rendering index); its RA average value is greater than 95,which makes it close to natural light and perfectly restores the color of the subject. •Lightness and Color Temperature Adjustable, introduces new dual encoder for light dimming. It's more convenient that the luminous intensity. AC POWER SUPPLY INCLUDED & 1 Year Warranty,supports batteries of NP-F series and external DC main of 8V and 5A. If you have any questions about this product by Bestshoot, contact us by completing and submitting the form below. If you are looking for a specif part number, please include it with your message.